What’s your life worth? David Dranove, the Walter J. McNerney Distinguished Professor of Health Industry Management at the Kellogg School, explains how to compute this chilling figure in his new, highly accessible book of the same name. But after discovering what the health care industry has in mind for you, you may not want to know. 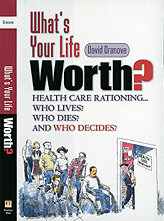 What insurers, employers and the government have planned, and indeed what they are already implementing, is “aggressive” rationing in the form of large co-payments, limits on using new technologies and long waiting lists for procedures, Dranove informs us in What’s Your Life Worth: Health Care Rationing . . . Who Lives? Who Dies? And Who Decides? (Prentice Hall, 2003). His book, which he says is the “only one of its kind,” was released in March and quickly overshadowed by the U.S. invasion of Iraq. However, it is now garnering attention — National Public Radio and NBC News’ “Today Show,” among other media outlets, have picked up the story — as the national health policy debate heats up and people are turning their attention to the Canadian system, where rationing is costing lives. The economics expert has studied other important health industry issues in his previous texts, including How Hospitals Survived (with Will White), published in 1999 by American Enterprise Institute Press, and The Economic Evolution of American Health Care, published in 2002 by Princeton University Press. His latest effort offers a sobering, comparative look into international health care rationing. Among the book’s findings is a calculation that will likely give many readers pause: The average going rate for a year of life is estimated at about $50,000. Dranove, who is also director of the Kellogg Center for Health Industry Market Economics, says the health care industry views rationing, which consumers dread, as the only way to control soaring health care costs. If you have a disease, it better be one worth curing. If you’re on medication, it better be one worth the cost — the cost to the industry, that is. At this moment, those in the health care industry are performing calculations to help them draw the line at what they’ll pay for and what they won’t. Their decisions, Dranove says, are at odds with the conclusions of health services researchers, who, after scientific calculation, place great value on new, potentially life-saving technologies. We shouldn’t take this bad news lying down, he urges. We can fight back by becoming more informed and asking our doctors to point us to literature, such as journal articles and Internet sites that review the evidence of the effectiveness of the medications we’re prescribed. Already in place with mixed results in Australia, England and Canada, rational rationing advocates the use of medical interventions that provide the most value for the money, while potentially saving thousands of lives and billions of dollars. In the United States, Oregon has set a stellar example of rational rationing by “putting everything on the table and prioritizing 750 medical procedures,” Dranove says. The publicly accessible list shows the cutoff for paying for procedures so consumers know upfront what they are dealing with. So go ahead: Read Chapter 8 in Dranove’s text, if you dare, and compute the value of your life. Then decide who’s right. Prof. Dranove is an economist whose research interests include industrial organization, business strategy and the economics of uncertainty, as well as the economics of the health care sector. Representative publications include: The Economics of Strategy (with David Besanko and Mark Shanley), Wiley (1996, 2000); How Hospitals Survived (with Will White) American Enterprise Institute Press (1999); and The Economic Evolution of American Health Care, Princeton UP (2000).